We went to see the new documentary by Wim Wenders about the great photographer Salgado this weekend. As we left, a couple that looked as dazed and overwhelmed as I felt looked at me and said, "I'm not sure what to do after seeing a movie like that." I told them I wasn't sure if i wanted to go drink, go pray, go cry, or go fast. First of all, if you don't know the work of Salgado, I suggest you google his last name and then go to images. You will be amazed. Now, imagine these images on a giant screen with the soft narration of the photographer telling the story of the shot and who died and who lived on. Sebastião Salgado was born on February 8, 1944 in Aimorés, Minas Gerais, Brazil. He is known for his work on The Salt of the Earth (2014), Looking Back at You (1993) and The Spectre of Hope (2002). Sebastião Salgado has won every major prize a photographer can receive, with his crisp, compassionate black-and-white images, many of them from war zones and other locations of human suffering, hanging on the walls of museums, galleries and private collections around the world. His books, including “Workers,” “Migrations,” “Sahel” and, most recently, the nature-oriented “Genesis,” have consistently met with commercial and critical success. Now, as if to complete the picture, a documentary film about Mr. Salgado, 71, and his work is about to opens in theaters across the United States. “The Salt of the Earth,” a collaborative effort between the German director Wim Wenders, who is also a photographer, and Mr. Salgado’s son Juliano Ribeiro Salgado, was nominated for the Oscar for best documentary film, won a prize at the Cannes Film Festival last spring and last month was also awarded a César, the French equivalent of an Academy Award. 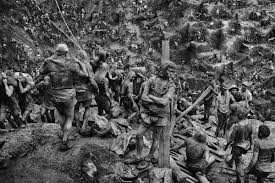 I have seen Salgado's coffee table books over the years and probably have a couple in my art book collections, but these images take on new power and depth on the screen. They actually seem to come alive. According to Variety, "Influential critics such as Susan Sontag and Ingrid Sischy accused Sebastiao of turning misery into an aestheticized object for Western consumption, yet reducing these photographs merely to beautiful images corrupts their intent and meaning. Certainly he has a trained eye for striking compositions, but his artistry lies in the way he combines beauty with sensitivity to the inner strength and dignity of even his most wretched subjects. The satisfying beauty of the shot doesn’t work against empathy but rather ennobles those he photographs, resulting in moving, synergistic compositions of deep humanity and drama." Earlier in the day, at our Sunday brunch, one of our wise ones said something about images and how they effect the brain. He said that they have a unique pathway to our consciousness that the language mind can't filter. Like music, they get under our skin and into our hearts where we become transformed and perhaps transmuted into a different kind of human being. Some images seem to be particularly powerful. When you have perhaps the greatest photographer of all time working with one of the great cinematographers of our time, it is imaginable that the synthesis of the two might not work. The opposite happened. And like any great movie, the third act comes just in time to rescue the viewer from a wrist slit. The result is a work of cinematographic art that has the power to change any and all of us. It should be seen on the biggest screen you can find. It's still on a big screen in Austin. For We are the Salt of the Earth.